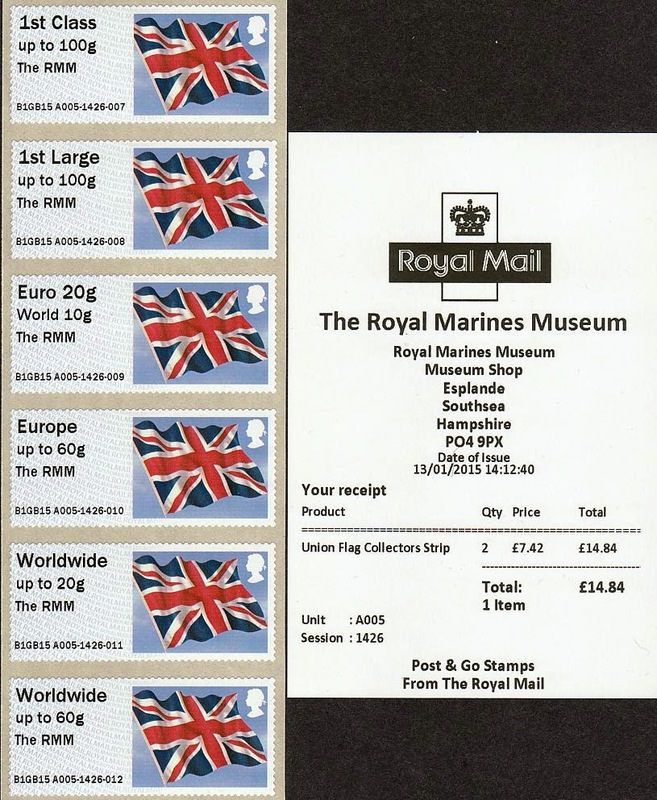 Right that two out of the four museums (five if you count the National Museum HMS Victory, but as it’s part of the Historic Dockyard complex I’ve not included it) to get a Post & Go machine. That only leaves two, the Royal Navy Submarine Museum or the Fleet Air Arm Museum, I wonder which will be next ?. On the plus side they all share the same online shop, so at least we know how much they’ll cost by mail order. Two out of four? Fleet Air Arm Museum is at Yeovliton in Somerset so not part of the south coast group. Perhaps you are thinking of the D-Day Museum in Southsea? But in addition there is the Imperial War Museum Duxford, IWM London, National Army Museum in Chelsea, RAF Museum in Colindale.... and so on. The four refers to the 4 museums which constitute the National Museum of the Royal Navy NMRN, the Portsmouth complex and one museum for each branch of the Royal Navy. As for other Armed services related museums and no doubt other similar organisations, getting their own Post & Go machines, they will surely have an eye on the NMRN’s experience. I can see little benefit to them apart from trotting off to the machine now and then to print some more stamps to sell by mail order at a marked-up VAT-inclusive price plus postage and packing, thus turning off collectors even more. I shan't be handling them, and I know that a number of collectors have decided to cut back to basics from 2015. This will only reinforce their decisions. 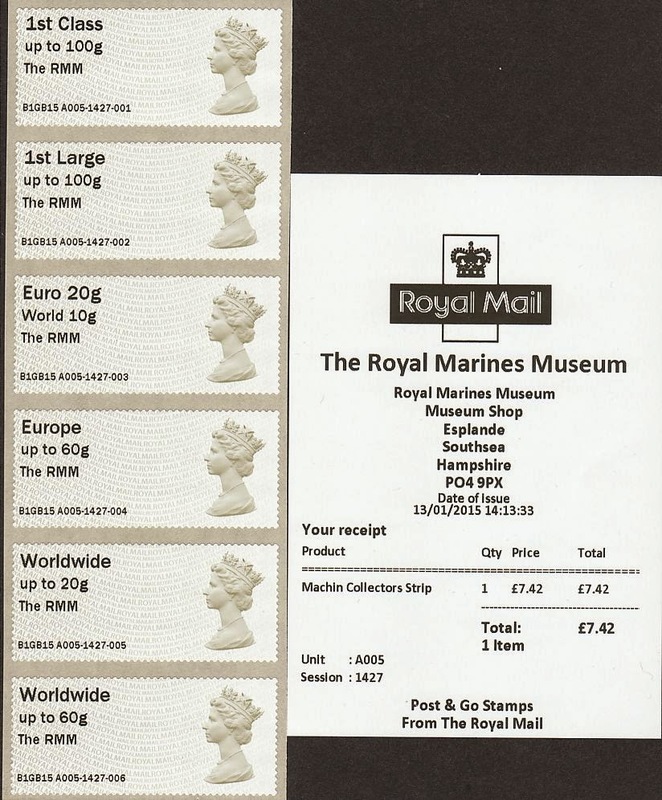 IAR's news page [http://iarroyalmailpostandgo.com/latestnews/] mentions the M machines, and also that A003 will find a new home as a static after Stampex. At least it'll make the trip worth it for two sites relatively close together. Can't but feel they've missed a trick by not getting it somewhere with a greater tourist footfall but I suppose from a maintenance point of view its easier to have two machines closer together. Does static identifier mean overprint? Although widely used by Royal Mail, overprint is the incorrect term, because all the black is printed in one operation. At museums and the BPMA the additional printing is a location or static identifier. At Stampex, Perth, and other exhibitions it is an 'additional inscription' - it still isn't an overprint. The BPMA publicity machine perversely uses the term 'underprint' which is even more wrong. Carbonisation or burning would be more appropriate. However what is the difference between the blank rolls having the service indication inscribed by the machines and stamps being overprinted with a new value, such as the overprinting of decimal values on pre-decimal stamps, a change in currency or as a stop gap measure. According to my old and battered copy of “Philatelic Terms Illustrated, they should be referred to as surcharged which is states is “An overprint which alters or establishes stamp’s face value”. PTI is correct, although I don't think I've met 'establishes a face value' before and cannot think of any instance where a stamp with no value has its selling price established by overprint/surcharge. (Somebody will doubtless now let us know of one from the 19th century. However, the analogy with Post and Go Faststamps is wrong because these are not stamps until the value is added. The printing of the service indicator and data string and, in some cases, a location or commemoration is done in one process to labels which have no previous value. Labels without the additional print should not be available (yes, I know they are - in profusion!) and thus the only stamp properly available to users and collectors is one with the 3-5 lines of black printing on the basic label. The 1890-1903 Parcel Post stamps from Reunion, which had typo frames with a circular hand stamp with a value of 10 centimes (SG p11/13), the catalogue mentions two type of handstamps. That's a non-pictorial frame, with a handstamp with not only the value, but the service indicator and name of the country. Not described by SG as a surcharge (or overprint) - the blanks may have been used for a number of other purposes. I don't think the Reunion ones are much different to the Faststamps, but if you want to use a different terminology than everybody else, that's fine by me. We already have 'overprint', 'underprint', and 'additional inscription', so why not introduce a fourth term? What a surprise!,considering there is a kiosk less than a mile away at the NMRN,are there no museums at all in the north of England?.Post&Go sellers from south of England will be rubbing their hands once again, give the north a chance for once!. The NMRN and the RMM are more than one mile apart, near to three miles. I know I was at the RMM last Tuesday. No public transport either for some of route so had to walk. Early rolls of Machins were undated. The first Machin roll put in to this machine was dated MA13. This roll was soon used up and the replacement roll was undated. By the end of day this roll was also used up and a third roll was put in which went back to dated MA13 stock. The Union Flag rolls were as far as I know all undated.